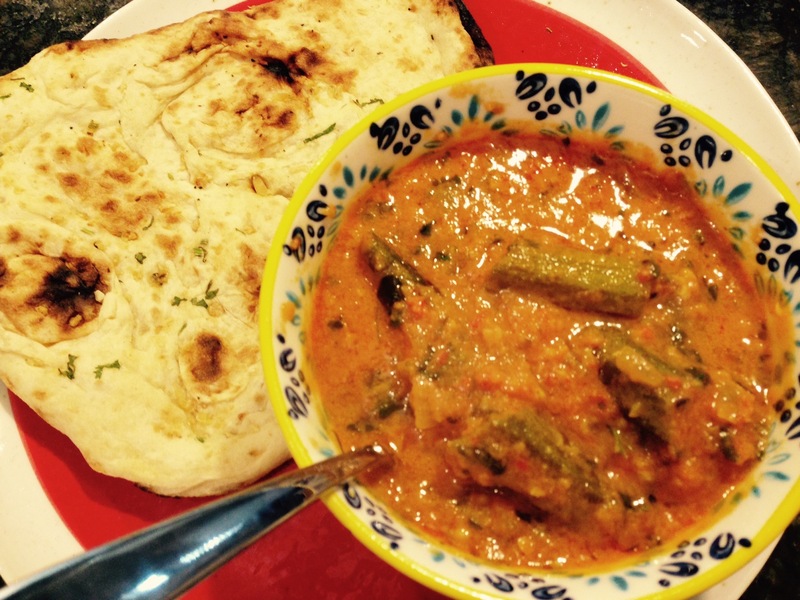 Bhindi Masala Curry (Okra Curry) – One Half Indian. This recipe came from Dassana Amit at Veg Recipes of India. The more Indian food I cook, the more I realize how awesome Amit’s blog is. Her recipes are often identical to how my mother-in-law makes things, and she gives really clear photos for every step. I can’t say enough good things about her Indian recipes! Plus, it’s in English! My husband loves bhindi (okra) and I love any meal that has a sauce with it. So this was a pretty good match for both of us. I will definitely be making this again. One tip that Amit gives that is spot on is to wash your okra and completely dry it before cutting it. You can leave it to air dry or dry off each piece with a cloth. If you slice okra while it is damp, it will become sticky and unpleasant to work with very quickly. In a food processor, place tomatoes, ginger, cloves, chilies, yogurt, cardamom, cinnamon, and mace. Blend all ingredients together into a smooth paste. Heat 2 tbsp oil in a kadai or other heavy bottom pan. Add the bhindi/okra and some salt. Saute them on a low flam until they are almost cooked, shrieked and brown on edges. When finished cooking, remove the bhindi/okra from the pan and let cook on a plate. In the same pan, add 2 tbsp of oil more. Add the bay leaf to the pan and wait 5-7 seconds. Add the chopped onion. Stir and cook the onions until they begin to brown on the edges. Lower the heat and add turmeric, chili powder, coriander powder, and cumin powder. Add the tomato-yogurt mixture carefully as it will splatter some. Saute the ingredients until much of the moisture evaporates from the tomatoes and a thick paste has formed. When it is ready you will see the oil separate from the tomatoes at the edges of the pan. Add the bhindi/okra to the pan. Mix all ingredients together well. 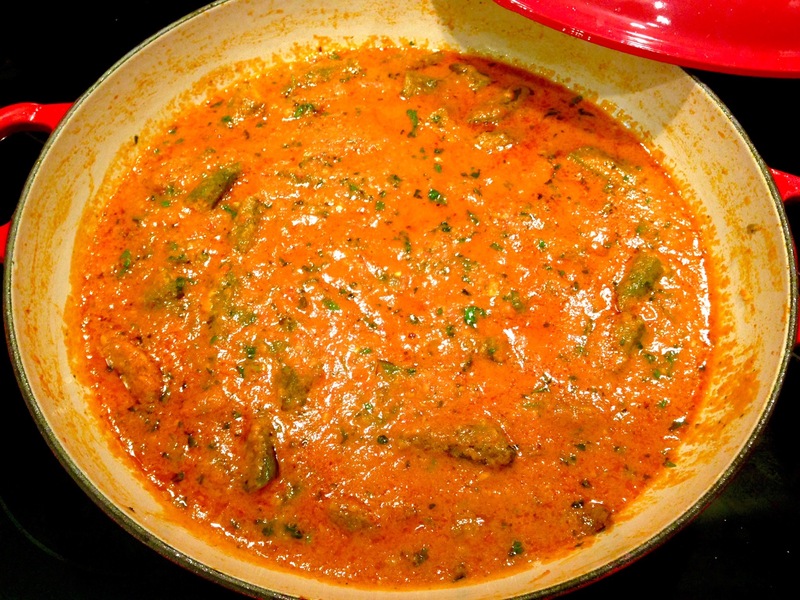 Simmer the sauce for 5-6 minutes more so that the gravy is infused with the okra. Don’t cook bhindi much longer or it will become mushy. Add kasuri methi leaves and coriander to the pot. Turn off heat. Stir a few times. Serve with chapatis, parathas, or rice.